Comox Valley Aquatic Club members learn the skills to compete—in the pool, and in life. Is swimming the best type of exercise? Many people think so and make swimming part of their regular fitness programs. Swimming suits all age groups and a great way to be part of the sport in the Comox Valley is through the Sharks Swim Club. The benefits of participating go further than one might think. Founded in 1975 as the Comox Valley Aquatic Club, the Sharks Club became a registered non-profit society in 1987. The Club has introductory, competitive and non-competitive programs focused on youth ages five to 18. The Club’s Shark School introduces the basic elements of the front crawl, back stroke, breaststroke and butterfly and also delves into competitive swimming elements like starts, turns and the pace clock. From there the competitive programs are tiered mostly by age group and are designated by shark types found in the Pacific North West. There are Thresher, Mako, Angel and Leopard Sharks with a Great White squad planned for the future. For youth aged 12 to 17 who do not wish to compete but who want to exercise in the pool there is the Shark Fit program. For people older than 18, the Masters program focuses mainly on fitness but some members do dip their toes into competitive swimming as well. All of these groups are overseen by a team of certified swimming coaches led by head coach Albert Burgund. The Club is “dedicated to the overall development of personal excellence.” Their long term vision is to “attract individuals of all ability levels and develop healthy champions in sport and life by providing a framework for success through progressive learning, personal growth and competition.” Coach Burgund, or as he is better known, Coach Albert, explains how these goals are achieved as the training transcends learning swim strokes. Burgund has been with the Club for just over a year. He brings to the job more than 30 years of coaching experience in Canada and abroad, a degree in kinesiology and a masters degree in education and coaching studies. He found his way to the sport of swimming by accident. He was a competitive downhill and freestyle skier and following a knee injury he was doing swim rehab when someone suggested he try competitive swimming. Eventually, that led to coaching and then to his studies and then more coaching opportunities. He is both knowledgeable and passionate about his work. “One of the reasons I got into coaching was to see the look on a person’s face when they accomplish something that they previously thought was impossible,” he says. It is clear that he also loves his job and the challenges it presents. The Sharks Club membership has grown steadily since he became head coach and he wants to see it continue to grow by at least another 10 per cent this year to reach an optimum membership of 100 swimmers. He credits a number of factors for the Club’s growth, including an active membership, a good competitive record and their participation in the community. The Club’s Shark School introduces the basic elements of the front crawl, back stroke, breaststroke and butterfly and also delves into competitive swimming elements like starts, turns and the pace clock. The connection between sports participation, healthy lifestyles and building life skills is readily apparent when talking to club members. Isabella Anderson, a Grade 3 student at Puntledge Park Elementary, and 10-year-old Issac Lepine, a Grade 5 student at Airport Elementary, both joined the Thresher Shark program in September 2011. Eight-year-old Anderson’s best event is breaststroke, and she likes the swim meets. “I really like improving my swimming and getting good at it and learning lots about it,” she says. Taya Seeley has been a member for three years and is now in the Mako Shark program. The 11-year-old Grade 6 Aspen Park student likes competitions and the opportunity to meet new people. “I do it for the effort of getting better and it’s fun,” says Seeley, who plans to swim competitively until she is about 15; after that she will primarily focus on her studies. Pearce, a Grade 8 student at Mark Isfeld, is in his second year in the program. He is a very fit looking young man and laughs kindly when I tell him I would drown if I had to swim pulling a small parachute behind me—as he was doing just minutes before. Does his recommend this time of torturous workout to his friends? “I tell them that it is hard and you feel really good after, and, it’s fun,” he says. Turnham is in his first year at North Island College studying science. He also coaches the Angel Sharks and does peer tutoring at the college. For him, swimming has helped him develop other life skills as well. One of Turnham’s New Year’s resolutions was to get back in the pool and swim, so he is thinking of joining the Masters program. You can swim three mornings a week with the Masters group. The first time you attend is free so you can see if it is a good fit for you. Coach Burgund supervises the program, which is made up of 25 swimmers ranging in age from 20 to 70. Amy Bauman, snow school administrator at Mount Washington Alpine Resort, has recently joined the Masters group, while retired teacher, Paula Dryden, has been a member for nearly a decade. They both are energized by swimming with the Masters. 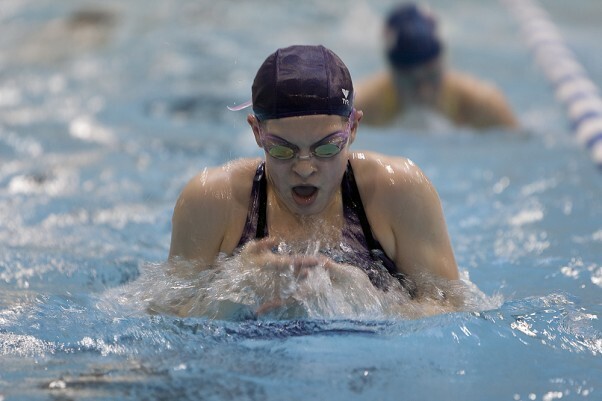 Bauman is returning to swimming after an eight year break following 17 years of competitive swimming that saw her compete in the 2000 Junior Nationals in the 100m breaststroke and 800m freestyle. The 29-year-old Cumberland resident says the club has improved her endurance ten fold and she enjoys the sense of community. “The motivation of training with the team keeps me going back morning after morning,” she says. Comox resident Dryden swam competitively from age eight to 11, and then took up running. She resumed swimming at age 49 to train for triathlons. Now at 65 she enjoys swimming three times a week in the Masters program. “It would be much harder to swim on your own. I would still swim but it provides a set time and place and others to swim with,” she says. Dryden’s children both swam competitively and her daughter, Nikki, was internationally ranked, competing at the world level from 1991 to 1996 and swimming for Canada in two Olympic summer games. Today Nikki is a human rights and immigration lawyer for a New York City law firm and she does global volunteer work in human rights and sports. In keeping with the theme that emerged throughout my exploration of the Sharks Swim Club, I ask Dryden for her thoughts about the benefits of children participating in competitive swimming. For more information on Sharks Club programs or to register yourself or your child, visit the Comox Valley Aquatic Club’s website at www.sharks.bc.ca.